BYOD (bring your own device) refers to employees who bring their own computing devices to the workplace to access enterprise data and systems and is quickly integrating itself into the enterprise. The proliferation of smartphones, tablets, laptops and the like has helped to fuel this emerging but powerful IT movement. As BYOD becomes more prevalent, operational issues such as compliance, mobility and security are all key areas that if left unchecked, can have a negative impact on your network and potentially cause data loss. But, for companies that have embraced the concept of BYOD and manage it properly, it has proven to increase employee productivity and creativity. 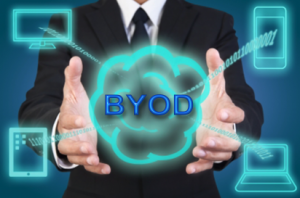 If your organization is ready to embrace BYOD technology, consider Trinity. Trinity Video Communications provides the most cutting-edge videoconferencing technology including software-based solutions and BYOD videoconferencing for commercial, healthcare, legal and law enforcement, education and government applications. Trinity’s Virginia office is located in Sterling, Virginia, near Dulles Airport. Trinity is headquartered in Louisville, Kentucky, with additional offices in Sterling, Virginia and Cincinnati, Ohio. To learn more about how Trinity can transform the way your organization communicates, contact a representative today at 800-261-9008 .